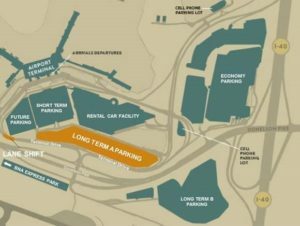 Beginning the week of Nov. 27, a portion of BNA’s Long Term Parking Lot A will be closed, allowing a power line to be relocated. Additional parking will be available at BNA Express Park, Long Term B and Economy. Construction will conclude Jan. 31, 2018, and a portion of the affected spaces will reopen at that time. Beginning Nov. 27, traffic lanes on Terminal Drive (the airport’s internal thoroughfare) will be shifted for approximately 800 feet after vehicles leave the terminal, before they reach Donelson Pike. BNA does not anticipate a significant impact on traffic. This lane shift will allow the widening of Terminal Road and the building of a retaining wall. Construction will conclude Jan. 31, 2018. Both of these projects are part of BNA Vision, the growth and expansion plan for Nashville International Airport (BNA). Learn more at BNAVision.com. BNA Express Park (1,230 spaces). Rates: $11 a day for covered parking; $9 per day for standard parking. Long Term B (2,124 spaces). Rate: $11 daily maximum. Economy (3,625 spaces). Rate: $11 daily maximum. For more information about parking at BNA, visit flynashville.com/parking.